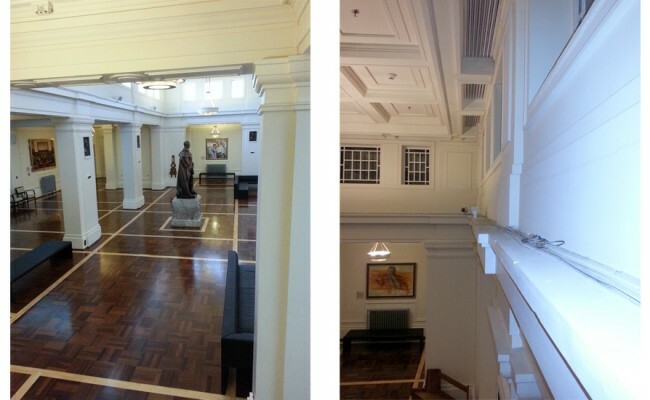 Kings Hall is a grand public space central to the Old Parliament House. Museum Of Australian Democracy as part of their plan to ‘activate’ the interpretation of the building propose to undertake more exhibitions within Kings Hall. Prior to this, conservation of the render in the space is proposed. MOAD OPH engaged SQC Architecture to investigate and document the scope of works required to restore and upgrade the render surfaces within Kings Hall. Following investigation of suitable investigation techniques, it was resolved to use the sounding technique applied to the external façade works. The scope includes investigation of original light fittings and investigation of electrical services. MOAD OPH provided measured drawings onto which the scope has been recorded. As Kings Hall is actively used throughout the day we closely liased with MOAD OPH to program inspections to minimise impact on visitors including night work. The specification methodology is being developed in consultation with a Render Conservator. The investigation phase will conclude mid May 2015 and documentation ready for tender by the end of May.